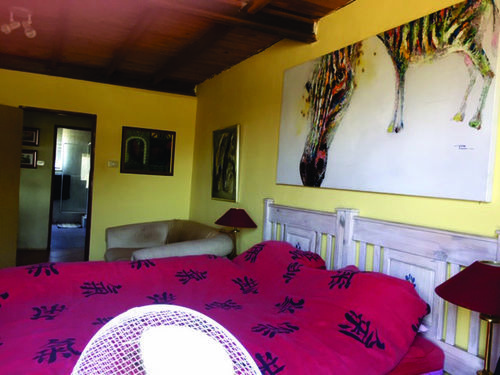 The farm is situated in the Rhenosterspruit Nature Reserve / Oori Private Game Reserve, 2.5km off the R512. It is about a 20 min. drive from Fourways and approximately 10min from Lanseria Airport on the one side and Broederstroom on the other. The farm is 46.7ha. A portion (6ha) has been fenced off around the house to keep the game out - the rest is used by the game. The main main building is a steel structure comprising 300sqm overall of which 120sqm have been converted into living space, the remaining square meterage being used as a workshop but can easily converted to stables. The workshop has thick rubber flooring. 2 Stables and Garages were added on at a later stage comprising an extra 90sqm under roof. The living space - although very simple - is fully tiled and consists of one bathroom with bath and shower, one bedroom and a very large open plan kitchen / dining room / lounge. The lounge has been fitted with a very good sized open fire place. 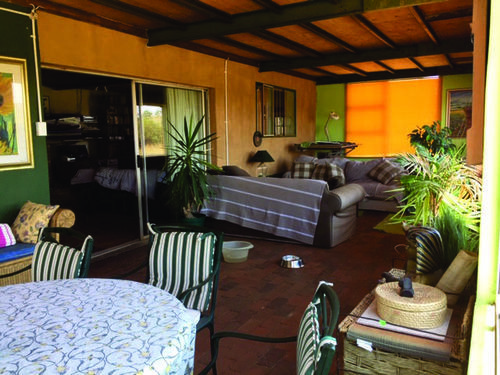 A 48sqm sunroom / conservatory has been added that offers spectacular views over the Magaliesberg. Since the ceiling has been constructed of steel beams and wood an attic / storage place on the first floor has become available featuring an additional 120sqm. (Due to the roof pitch only about 80% standing hight). This can be converted to an extra bedroom and / or study. After having fitted a solar system the whole house is run on solar power. The stove / oven and hot water system is run on gas. A fast and stable internet connection with WIFI has also been installed. The farm has two boreholes providing ample water. Furthermore there are two reservoirs for the collection of rain water. The farm is not bonded and is in a close corporation.